Box Tree Cottage, Barbon. Delightful 2 bedroom cottage in village location within easy walking distance of the local pub and village shop. This stunning cottage is equipped with everything you could need. We were lucky enough to have lovely weather and enjoyed making use of the beautiful garden. The owners next door made us feel extremely welcome and were on hand if we needed anything. We were also made to feel very welcome by locals and the staff and the Barbon Inn (great home cooked food). We would definitely recommend this cottage and will be returning. Box Tree Cottage has everything you need for a comfortable break in the countryside. The cottage is beautifully presented and has been tastefully furnished and decorated. Perfectly situated for fantastic walks either in the Lake District or North Yorkshire with all the amenities you could possibly need close to hand. The owners of the property are a lovely couple and make you feel most welcome throughout your stay. Box tree cottage is a beautiful cottage, everything is to such a high standard, absolutely beautiful!! The position is wonderful with walks straight from the door with the dogs and walking distance to The Barbon Inn which is a lovely local pub, staff very friendly and food excellent. Great enclosed area outside for the dogs and utility room in the cottage for them to dry off. Peter and Jan are so friendly and make you extremely welcome. Had a truly wonderful time and can’t wait to go again. Thank you Peter and Jan.
A wonderful home from home experience in a country side cottage. A superbly appointed cosy cottage with everything catered for. Excellent utilities, high end furniture and fittings. Great paddock to let the dogs have a run about first thing in the morning. Great location, easy access to many other areas within driving and walking distance. Virtually no traffic through the village. It was very quiet and peaceful. All modern tech communication, wifi, smart tv etc..
Evening entertainment - Glass of wine ( a gift form the hosts) a cosy log fire and a binge watch on Netflix!! Perfect end of year de-stress for 3 days. We have been staying at Mill Cottage in Middleton for the last 15 or so years, and have usually walked into Barbon across the fells or through the fields and along the lane, eating at the Inn or Church Mouse (since John and Jules moved in). This year, with Mill Cottage on a long term let, we decided to stay in Barbon, in Box Tree Cottage, with the Church Mouse and the Inn on our doorstep, That was a truly excellent decision. Box Tree Cottage is probably the nicest cottages we have ever rented. Lovely in every respect, including the owners, Peter and Jan, as well as benefiting from the care of the Mill House team. We felt very welcome. We will be back! This was our second visit to Box Tree Cottage. It has been the ideal spot to relax and enjoy a break with everything you need at hand. The cottage is stunning and in a brilliant position for nearby walks, great food at the local pub, and no distance by car from Kirkby Lonsdale. Mill house Cottages run a very professional company and so helpful. The owners of the cottage are friendly and make you feel so welcome.....a home from home in an idyllic spot. Box Tree Cottage is a beautiful stone property in the quiet village of Barbon which has been thoughtfully and tastefully restored by owners Peter and Jan who live just next door. Each room is finished to a very high standard with top notch furnishings and appliances. Outside is a cosy flagged terrace (lovely sun trap) which leads onto a pretty private country garden. There is also a much larger grassed area at the back of the property (ideal for exercising the dog) leading down to a beck. A ten minute walk takes you to the village pub (which serves meals) and local shop/cafe/deli. Also very well placed for exploring the Yorkshire Dales, Lake District and surrounding areas. This is an extremely comfortable and well equipped cottage and we thoroughly enjoyed our stay. Peter and Jan made us feel very welcome and we would definitely return in the future and have no hesitation in recommending Box Tree Cottage! Beautiful cottage with attention to detail. A beautiful and luxurious cottage that had wonderful attention to detail and everything considered. Furnished and finished to a high standard. Ideally located for walking and a peaceful location if you want to get away from things but only a few minutes from Kirkby Lonsdale for convenience. I am not easily pleased and I was delighted that the cottage looked better in life than in the photographs. We absolutely loved our holiday at Box Tree Cottage. Peter, Jan and the dogs (!) were really welcoming and friendly and the cottage was wonderful. Every detail has been carefully thought out to make the cottage a luxurious and relaxing place to spend a few days. The location is incredible-a beck at the bottom of the garden, a fell to climb just down the road, a lovely village with a friendly pub and cafe/bistro. And we were so lucky with the weather-we spent a couple of nights out in the garden star-watching! Our second visit to Box Tree Cottage and we weren't disappointed, still one of the best SC cottages we have stayed. The big difference for this visit was the weather, glorious sunshine, and thankfully not the scorching 30C plus temps in the south, which meant we were able to walk and cycle in lovely conditions. Walking and cycling from the door, but also lots to explore within a short drive. The cottage's facilities are 5*, Peter and Jan have done a wonderful job of the renovation and it has everything you need and probably more!! I am confident we will be back for more visits!! We have had a wonderful weeks stay in beautiful Box Tree Cottage. The cottage is situated in the village of Barbon not far from Kirkby Lonsdale, with a great local pub within walking distance, serving excellent food and local beers. The cottage itself is of a very high standard, beautifully and very tastefully decorated. Everything you need and more, and exceptionally comfortable. A perfect base for local walks, and not far away from the great Lakeland Fells, Yorkshire Dales and Trough of Bowland. Kirkby itself has many wonderful shops, bars and restaurants all exceptionally friendly, including our four legged friends. A absolute must if visiting the area, and would highly recommend. Quite simply the best holiday cottage we have stayed in....great location for both the Lake District and the Yorkshire dales. The local pub which is a ten minute walk offers great food and is dog friendly. The cottage is simply stunning and the attention to detail is very good. A beautiful, clean, comfortable and well equipped cottage in the lovely unspoilt village of Barbon with it’s pub, coffee shop, views and walks. Really enjoyed our stay. A delightful place to stay - very well positioned for easy access to the Lake District and Yorkshire Dales. Box Tree Cottage is tastefully decorated contemporary with a traditional feel and fitted with the highest standards of mod cons with lots of natural light and a cosy log stove in the sitting room. Kitchen is fully equipped and all of ground floor is underfloor heated. Useful warm utility room for dogs to sleep and dry off. There is a field directly outside the kitchen where you can go to the beck running through for the dogs to have a paddle. The village Barbon is delightful with its own inn and a village shop / cafe plus loads of walking straight from your doorstep. There are plus several great pubs & inns in area by car within 5 miles if you are staying for a week plus for more interesting local food. Kirby Lonsdale is a must to visit. We will be back! Box Tree cottage is the perfect place to relax and unwind. The furnishings and decor are of an exceptionally high standard and you immediately feel comfortable. The cottage is spacious and very easy to live in. Special mentions need to go to the open fire and amazing bathroom! The location is tranquil and yet not too far away from places such as Kirkby Lonsdale and Hawes which are perfect for days out. The host was there when we arrived to show us around but we were then left to our own devices which was perfect. Our stay was very memorable and without hesitation would recommend it. This was our second stay at Box Tree after visiting at Easter. A stunning cottage with absolutely everything you need so if the weather isn't good one day, it's a treat to stay home in front of the log burner and chill. The location is great with easy access to the Lakes and Yorkshire Dales. Peter and Jan are lovely friendly hosts and make you very welcome. We will definitely return again and would thoroughly recommend Box Tree as a luxury relaxing break in a beautiful location. Box Tree is a real treat. Luxuriously equipped throughout, it really felt like home for a week, only better!! The cottage is in a lovely village and is within 45 minutes of a multitude of great foodie opportunities. The cottage is immaculate throughout. There is no need to take anything with you. There is a lovely village shop which serves all the basics, and treats, and a quality supermarket less than ten minutes away. I'm sure we will return. Box Tree Cottage was everything we could have hoped for and more. We had an extremely relaxing week in the most beautiful setting. The cottage has been designed to an extremely high standard and had everything we needed, with the local shop and pub being a short walk away. Peter and Jan, the owners, were so welcoming and made us feel at home as soon as we walked through the door. Will definitely be back! A stunning cottage with all home comforts provided. Situated in a pretty quiet village with a pub and cafe, lots of lovely walks on your doorstep and the cottage is in lovely grounds, ideal if you have your your legged friend with you, as we did. About 3 miles from beautiful Kirkby Lonsdale and all its facilities and of course the big lakes and stunning walks not far away. All in all a fab place to stay, we'll definitely return. Lovely hosts Peter and Jan. When looking back on our stay , we have said how much the weather made it for us , so we count ourselves quite lucky. This cottage is outstanding in our opinion. The owners were very kind to us and our friend who popped over to see us from Lytham. We had a lovely warm welcome from the owners . The viilage is fortunate to have a good eating pub and café, who also gave us a friendly welcome over the week we stayed. It was thoughtful that the welcome basket was well stocked, so many times have we had the obligatory bottle of wine and nothing else, not ideal for breakfast ! We thank "mill house cottages" and the owners of Box Tree Cottage for a wonderful stay. Good luck with the racing car!! We have just enjoyed a very pleasant five day February break in this delightful cottage set in the village of Barbon nestling at the foot of the Yorkshire Dales. Waking up each morning, coming down stairs to feel the warmth of the underfloor heating and being able to look out of the windows to see the fells in one direction and the Lune Valley in the other was a real treat. The cottage is well equipped, in excellent condition and was spotlessly clean, and despite being modern has a real cosy feel about it. In our short time there we were able to combine a little local fell walking, with numerous trips into Kirby Lonsdale, a few minutes drive away, and some longer trips into the Lakes. We thoroughly enjoyed our stay at the cottage and would happily recommend it to others. We stayed 5 nights in Feb school holidays. The cottage itself was very nice with no expense spared when being renovated which makes a huge difference. We have stayed in other properties and this was one of the best. The location of the cottage is great for access by car to the lakes or the dales. The village of Barbon where the cottage is located was very friendly and we ate in the Barbon Inn and also used the Churchmouse shop and bistro. There's lots of places to visit with children, we visited the Beatrix Potter Experience in Bowness, the Safari Zoo in Barrow, White Scar Caves in Ingleton amongst other places in between. The local town of Kirkby Lonsdale is small but has some really nice shops, we also visited the Kirkby Lonsdale Brewery which is well worth a visit if you like your ales (and coffee & cake). Pub restaurants nearby the cottage we visited were The Plough and The Pheasant - they were both equally as good for food. Overall our stay was really nice and we would definitely recommend to stay at Box Tree if you are looking for a short break away. Peter and Jan the owners of the cottage will welcome you and answer any questions you may have. A luxury cottage on the edge of a traditional village within easy access to all the places of interest and good amenities. Lovely hosts who were clearly very passionate about Barbon and giving guests the best possible experience. Great village pub and tea rooms/store. Couldn't have wanted anything more. We had the most lovely time over the Christmas weekend. The cottage is set in Barbon, handy for accessing Lake District and Yorkshire Dales, and offers beautiful walks locally. Everything inside is furnished to the highest standards, hosts Peter and Jane were lovely and kind - offers great tips for keeping the fire going! Can't recommend this place enough, would definitely visit again. We were one of the first visitors to Box Tree Cottage when we visited in June. I provided a substantial review at that time. It speaks volumes when I say that we booked this second visit in September having enjoyed our last stay so much. We were the first returning visitors. The standards have remained just as high as has the welcome provided by Peter and Jan. We certainly expect to book again next year. We cannot praise Box Tree Cottage enough! We had a fantastic stay in this excellent cottage which has been renovated to such a high standard. We would definitely recommend this property. 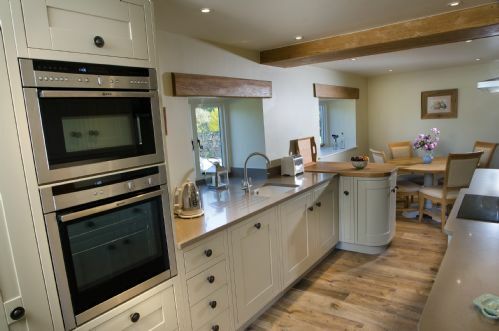 The cottage was immaculate with every possible feature or appliance you could wish for. The owners could not have been more friendly. They were so welcoming and helpful and made the stay even more perfect. We had a lovely 3 night stay at Box Tree Cottage. The house itself is gorgeous and finished to a very high standard. We felt at home as soon as we arrived. Jan made us feel very welcome and was on hand if we needed anything. My daughter loved the dogs Darcy and Fergus and was beyond excited to be able to walk one of them back from the shop. I think that was the highlight of her holiday ! Barbon is a lovely little village and we ate at the local pub on e evening which was very good. We also made good use of the little shop and it became our morning ritual to wander down each morning. Further afield we visited Cartmel and spent an enjoyable few hours there. White Scar Cave which is well worth a visit too. We were sorry to leave Box Tree Cottage and very much hope to make a return visit. Absolutely beautiful cottage! The owners who lived next door made us all feel very welcome. The front garden is idyllic. Out the back is a paddock which is huge and great for the kids to play on. Inside the cottage has been decorated to an exceptional standard. Everything you could think of is there...including a picnic hamper, gin glass, Internet TV, gorgeous white company bedding...the list is endless. The location is perfect in a quiet village with a pub and a shop yet close enough to kirkby lonsdale. Great Base for exploring both the south lakes, Yorkshire dales and the lune valley. Amazing cottage, amazing people and a lovely surrounding area in an idyllic setting. A real gem and one we'd ideally like to keep a secret, but that wouldn't be fair on the loverly owners. Cannot rate this fully equipped and immaculate cottage highly enough. You won't be disappointed. We enjoyed staying at Box Tree Cottage, very attractive and well located for the beautiful Lune Valley and the western part of the Yorkshire Dales. However, two of our three person party fell over due to the deceptive step down into the bathroom, one hurting her foot badly - and it could be really serious if someone hit their head. The problem is that the floor tiles both sides of the step are the same and so it's not easily visible. The owners told us that people have mentioned it before and it is important that they address this before other people have accidents. What a gem of a cottage, 5 star all the way! We do cottage holidays a lot in the UK and have to say this is the best one yet! From the minute we arrived to when we left, we had a lovely welcome from Peter and Jan. You cant help but go "Wow" when you first walk into the cottage. Its beautifully decorated and equipped to a very high standard and spotlessly clean. It has everything you could want from a cottage. We didn't get the weather we wanted, but being rained in most days didn't matter so much, as it was nice to relax in the cottage. We'll definitely be doing another trip back in the Winter. Beautifully appointed cottage, facilities are as it states 5 star. Would not hesitate to book again. The standard of décor and finish in the cottage are superb, the mood lighting in the bathroom with the huge bath was real luxury. Barbon is a pretty village but handy for visiting the local area. We couldn't have been more pleased with Box Cottage. The design of the cottage and the equipment levels were fabulous. The choice of decor and furnishings were all at the top level. The village of Barbon is charming and very quiet. It is a pleasure to sit outside the cottage for coffee or lunch and enjoy the lovely garden. The cottage owners, Peter and Jan were very friendly and welcoming. We already plan to pay a return visit this year. Just had a wonderful week in Box Tree Cottage. Peter and Jan are fabulous hosts. The cottage itself is beautifully furnished and is in a stunning location. We were sad to leave but will hopefully return soon. What a lovely situation & fantastic renovation. It has been done sympathetically with all the home comforts one could wish for. Pever & Jan were excellent hosts. We were so well looked after with kindness & consideration plus if there was a minor problem it was dealt with immediately. Box Tree Cottage has been renovated to the highest standard with nothing missing or over looked. We stayed for 2 weeks and never felt cramped. The location in Barbon is great for quick access to the fells and village with a good pub along with a shop which doubles as a cafe / restaurant. The hosts Peter and Jan are welcoming and go a long way to make your stay as homely as possible.